"You can have whatever you want, only you discover there is always a price. The question is -- can you pay?" So writes Charles Dickens in one of his notebooks, reflecting the main theme of this novel -- human desires and the consequences of acting on or denying them. 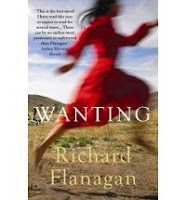 Wanting is set during two different time periods and in two different countries, with two separate narratives. The link from the past to the novel's present is Lady Jane Franklin, wife of Sir John Franklin, who served as Governor of Van Diemen's Land (Tasmania) and then later died while on the ill-fated Northwest Passage expedition. Throughout this novel there is a particular recurring theme, that of "wanting," and disciplining the heart -- and the question often revisited is this one: what is it that constitutes being a "savage?" According to Dickens, in a conversation with Lady Jane, the distance between savagery and civilization is "the extent we advance from desire to reason," keeping our passions and basic human natures in check. The question first arises between Dickens and Lady Jane as she reads in the London Illustrated that according to a group of Eskimos that spoke to explorer/surveyor John Rae, some members of the Franklin Expedition had resorted to cannibalism. Seeking Dickens' help to uphold and defend her husband's honor, Lady Jane remarks that she knew some "similar savages," when she was in Van Diemen's Land. While in Tasmania (1836-1843) Lady Jane, pompous and determined to bring British values and other rather snobbish accoutrements with her, decides to embark on a "scientific experiment," and adopts a young Aboriginal girl Mathinna. It is a time in which the indigenous peoples are being hunted down and taken off of their land to make way for their colonizers, and Mathinna is living with others under the shelter of Reverend George Augustus Robinson, known as "the protector." Lady Jane cannot have children of her own; she decides that it is, after all, the age of reason, and decides that it would be a great opportunity to try to take a "savage" under her wing and turn her into a proper Englishwoman. The narrative goes back and forth in time between the Franklins' stay in Tasmania and an episode in the life of Dickens, when he comes to terms with his growing dissatisfaction with his marriage, the production of the play "The Frozen Deep," and ultimately meeting Ellen Ternan. Not to be read as a novel of history (according to the author), Wanting leaves the reader focusing on the effects of desire. Is it even possible for human beings to "advance from desire to reason?" What price are people willing to pay for what they want? On the other side of the coin, the author also examines the denial of one's desire and the often-devastating consequences it can produce. There is a lot going on in this book and it is often difficult to read because of the subject matter in some parts. Be warned: some scenes are very sad, some scenes will make you angry, and some will be simply heartbreaking. Yet at the same time, it's really quite well written, and the author has no problem maintaining his main themes throughout the novel. I'm not exactly certain why the author chose to use Dickens as a character, unless it was so he could make use of the imagery and themes of "The Frozen Deep" and what it has to say about being "savage" vs. being civil. I was so caught up in the story of the Franklins, Mathinna and the treatment of the aboriginal peoples that it was almost a shock to get back to England when the narrative would change. That's not to say that Dickens' story was not well told; it was just that the changes interrupted the reading flow. Overall, the novel was a good one, a story I thoroughly enjoyed reading, and I'm happy to add it to Gould's Book of Fish on my home library shelf. I am glad you appreciated this novel. It is intensely moving in parts and the feelings it evokes stay with you a long time after reading. I actually felt similar to you about the Dickens story line at first, but came to the conclusion that the shock and interruption felt as reader was intended - a mirroring of the feelings of the original inhabitants of Tasmania having thrust upon them a culture so vastly different from their own? There are so many levels to this novel. I loved Gould's Book of Fish, but for some reason I haven't sought out any of his other books. After reading your review I'll ensure I keep an eye out for this one. Jo: I never thought of it like that, but you may have a good point there! Thanks again for sending me the book! Jackie: Gould's Book of Fish is one of my all-time favorite books ever. I have a few more of Flanagan's books to get through, but I want to explore other Aussie authors first. I'm having some trouble reading sad books right now, but this certainly sounds like something I would like at a different time -- I do love books where people are forced to operate outside their culture. Thanks for your review! I found this to be heartrending and an unsettling mediation on the destructive force of desire, and I loved it. I've not yet read Gould's Book of Fish, but it is on my (evergrowing) list! Col: This one is tough to read, for sure, but well worth it. Mummazappa: I really liked it -- and definitely try Gould's Book of Fish.